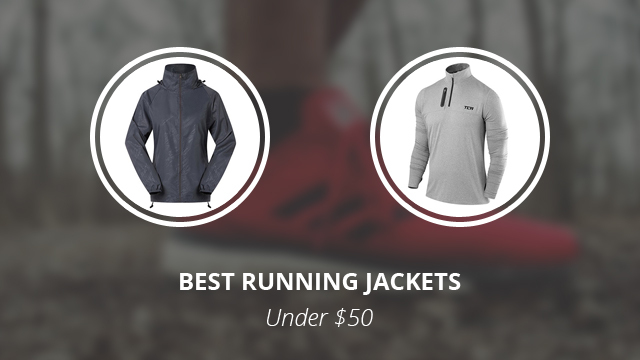 In today’s article we will be going through a selection of running jackets for men and women, which are well-made and most importantly, very affordable, all of them being under $50. Because we value honesty, let us preface this selection by firstly saying that running jackets are not a necessity, especially if you are a casual runner. The reason why they were developed is to meet certain requirements that other jackets might fulfill, but are usually a bit too much for running, if that makes sense. Hence, why we have running jackets, which are designed to be lightweight and focus mostly on their wind-resistance and breathability features. They provide a great protective layer through all seasons, especially during rainy days. With that being said, let’s take a look at our picks for you. * Note: The availability of the products in this page (including colors and sizes) might change at any time. Also please check the products materials and features on the various shops before buying. We do our best to assure the accuracy of our articles, but sometimes they might contain errors. The product images shown are for illustration purposes only. The price (under $X) refers to Amazon.com. We will start things off with the choices for men and the first one is by Baleaf, a woven windbreaker jacket, which is made of 100% Polyester. It is a very lightweight design, with water-resistant abilities and considerable breathability, which will prevent overheating, a common issue for runners. The collar is hooded, which in turn is adjustable with drawstring, as is the lower hem. The sleeve cuffs are elasticized in order to fit snuggly and prevent the elements from getting through. 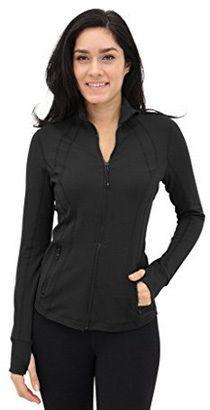 There are two side pockets with zipper closures and the main zipper itself is full-length and there is also chin guard on the collar, to prevent zipper chaffing of the neck and chin. This jacket comes in the colors: Dark blue, Orange and Sky blue. 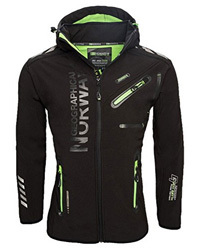 By Przewalski we have selected a softshell jacket, which is designed specifically for runners and cyclists. 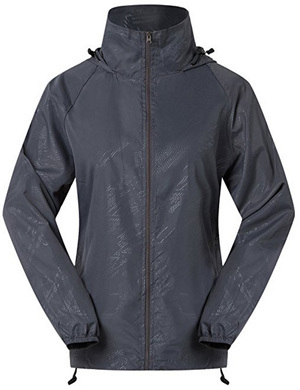 It has a windbreaker outer shell, which is also water repellent due to the DWR finish on the arms and chest. However, it is a jacket more suitable for dry weather. As with most softshells, this one, too, has a high breathability rating, able to wick moisture away and maintain a correct body temperature. This is a Polyester jacket, with fleece lining on the inside, which is brushed in order to provide added comfort and better insulation. To keep you safe in bad weather and dim lights, there are reflective stripes, as well as a reflective logo. It comes in the color Black. 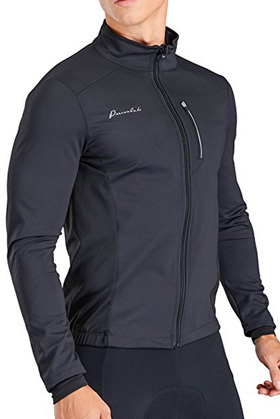 The third men’s jacket is by Tesla, the Performance Training hoodie jacket. It is made of 91% Polyester and 9% PU, which provide great elasticity and make movement a lot more comfortable and easier. This is a jacket suitable for Spring and Fall to be worn on its own, and as a mid-layer during winter, under a hardshell, preferably. 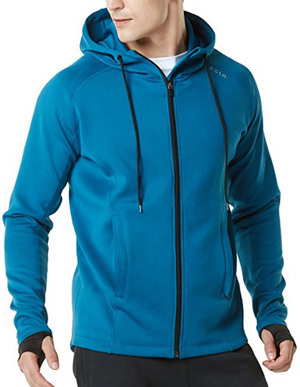 It comes with a front zipper, despite the design resembling that of a hoodie. There are wrist gaiters and two side pockets on the outside. The color selection includes 8 options: Black, Light grey, Crimson red, Navy, two Grey options, Khaki, Blue. 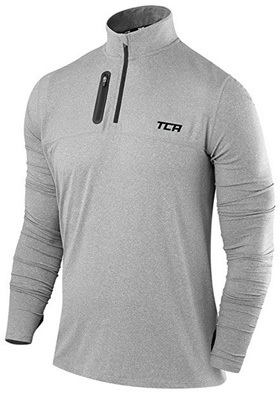 The last jacket for men is by TCA, the Fusion Pro QuickDry running top. This is a very interesting design as it comes with a half-zip and a high collar, made to resemble a top rather than a jacket. It has quick-drying abilities, as well as Light-Touch fabric that makes it a lot more comfortable to wear. 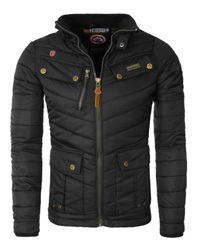 This is a highly functional and high-performance design, with a very breathable shell that wicks moisture away. The sleeve cuffs come with thumbholes, to ensure a better and more comfortable fit. There are 5 colors to choose from: Black, Deep blue, Heather grey, Heather grey / Black and Heather grey / Yellow sonic. Now it’s time for the women’s jackets. The first one is by 90 Degree By Reflex, an elegant design, which comes with wrist gaiters and two zippered pockets on the outside. The fabric is a blend of 81% Nylon and 19% Spandex, which makes this jacket extremely comfortable to wear and easily adaptable to movement. This is an important feature for runners, who require agile and practical clothing. It is a hoodless design, with a medium collar and it is more suitable as a spring jacket, in dry weather. There are 6 color options available: Black, Camel, Iron blue, Silver lily, Spring hill and White. Moving on to a windbreaker jacket, this one by Cheering is called the Super Quick Dry jacket and it comes with UV protection qualities, too. The fabric is 100% Polyester, resistant against water, fully windproof and fast-drying. It is also very lightweight, a suitable choice for casual and avid runners alike, especially because it is packable as well, so you can take it with you anywhere. It comes with an adjustable hood and a high collar, as well as elasticized sleeve cuffs and an adjustable hem. 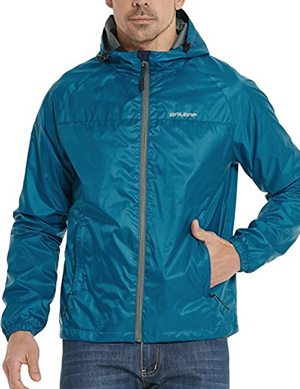 The UPF is 40+, so you are good to go in rain and shine with this jacket. It comes in the colors: Black, Blue, Grey White, Acid blue and Hot pink. 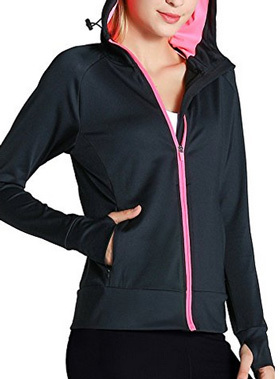 By Fastorm we selected this Activewear jacket, which comes in a hoodie-like design, with a full-length zipper and thumbholes on the sleeve cuffs. The fabric is very stretchy, due to the 13% Spandex it contains, the remaining 87% being Polyester. 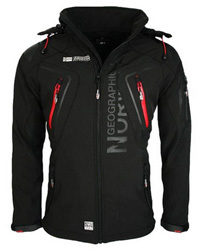 It is a very lightweight jacket, warm and comfortable, with the ability to dry out quickly if it gets wet. There are outer pockets, as well as two inner ones so there is quite some room for storing your belongings. It is available in 5 colors: Grey, Neon lime, Neon pink, Purple and Hot pink. We will be ending this selection with a beautiful jacket through and through and not only in design. 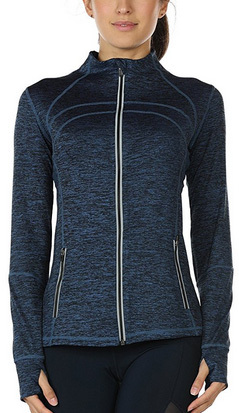 icyzone‘s running jacket is designed to look like a shirt, with its lengthy sleeves and short collar. The cut is very elegant and it comes with two outer pockets and thumbholes on the cuffs. It is a slim-fit design, which is made of 90% Polyester and 10% Spandex, so it is elastic and comfortable to wear. The fabric is water-resistant, wind-resistant and fast-drying, suitable for strenuous physical activity. 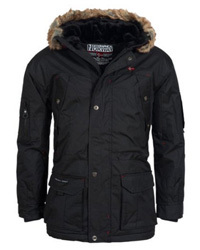 Because it comes without a hood and it is so lightweight, it is best suited for dry weather and mild temperatures. There are 6 colors to choose from: Charcoal, Royal blue, Black, Lightning, Monochrome and Gray mélange. Previous Article← Ski Jacket vs Snowboard Jacket: What’s The Difference?